Darius, a sensitive 900's B.C.E. kind of guy. Xena comes to the rescue of a band of villagers who are attacked by Sphaerus, the son of the warlord, Cycnus. 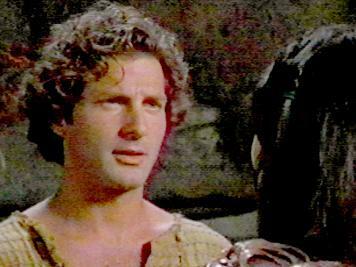 One of the villagers, who ultimately helps Xena after she is injured in the skirmish, is Darius. Darius, an incredibly nice guy. Darius is a peaceful, mild-mannered villager who loves and cares for his children very much. This is evidenced by his attention to their activities. His little daughter plays with a straw horse which he probably made for her. He teaches his sons the proper way to hold carpentry tools. He also hardly ever lets them out of his sight. When Xena tells his children stories of some of her conquests, Darius makes sure that there is no mention of violence. Darius is also very compassionate. He tells the village elder that taking care of a wounded woman in his house, even if she is a well-known warrior, is not an act of war. He does concede, though, that as soon as she is well he will ask her to leave. Darius obviously wants to have a woman who can love him and care for his children. We know that his wife has died, but we don't know how. Was she perhaps killed during the Trojan war? Is that why he abhors war? He tells Xena before she leaves in the end that he has a home and a family, and that she can have that as well. He then hopes that she finds her happiness. Darius is also a very fair man. He realizes that Xena is a warrior, and although he would rather she not be one, he rushes to return her chakram to her knowing that she probably needs it to defend herself. Darius would be any woman's ideal man: gentle, non-violent, loving and compassionate. Unfortunately, while Xena would like to eventually end up with someone like this in her life, the time is just not right. She has a long path to go before she can feel she can accept someone like Darius. Darius hates war and violence. He left Troy and gave up the life of a soldier because of this abhorrence and went to seek a peaceful life among peaceful people. He misses his wife and wants to find someone whom he can love as much and who can care for his children. Although he feels he can come to love someone else, he loves his first wife and will forever keep her in his heart. Although he was a soldier, Darius feels that many aspects of fighting are just not tolerable to him. He does not know what to do to properly remove an arrow. Xena has to teach him how and then has to guide his hand properly because he cannot do it himself. Darius feels that words can do more than actions. He is willing to meet with the warlord's son, Sphaerus, in spite of Xena's trepidation, to hear what the warlord has to say about living together in peace. He is very upset at Xena for using violence to thwart the warlord's men when they were attacking the villagers. He feels that she was precipitous in her actions, and because of this, he has to gather up his family and once again move to find another place to settle. When Xena tells him that eventually he has to face up to some things and fight, he tells her: "Do you think I like running? I've seen the pain that war brings and it's what I have to do to bring my children to safety." 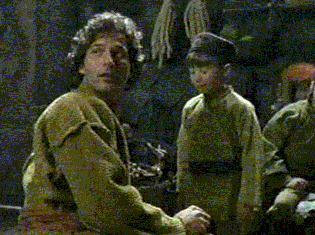 At the end of the episode, Darius would like to have Xena stay with him and the children. He points out to her that she has a ready-made family willing to love her. He is ultimately hopeful that eventually she would come back to him. Xena joins in on some quality time. Darius is a very important person for Xena on her road to redemption. In him, and his children, Xena sees someone who can love and accept her in spite of what she had been. When Darius asks her to dress up in one of his wife's dresses, she gazes at herself in a mirror, perhaps wondering what life would be like being his wife and a mother to his children. She is willing to accompany him to hear Sphaerus and only when the village elder confronts her at the meeting place does she feel that perhaps her dreams of love and security were a bit too good to be true. She sees Darius as a peace-loving man, but she reminds him that there are times when one must fight for one's beliefs and it seems she is a bit disappointed that he would rather pack up and leave instead of staying to fight. When Darius tells her that bringing his family to safety is what he has to do, she tells him to go ahead, but that she has to do what she has to do. When things have been resolved, Xena allows herself a moment to consider what it would be like to once again have a family. When Darius tells her he hopes she finds happiness, she replies: "I did, I just have to leave it for a while." We don't know if Xena will ever see Darius again. Probably not. Most likely he has already remarried and settled down happily with someone else. He is just too good a man for any woman to pass up. However, in him, Xena has glimpsed a life that she eventually craves for. The fact that he appears really early in her search for her soul's redemption only has to add to her self-worth, that someone as good as Darius could possibly see in her a life companion and is willing to have her in his and his children's lives. That is why his path into her life, although very brief, is probably one of the most important events that Xena has encountered. Even Argo likes the guy!!! I have an M.Ed. from Columbia University. My hobbies are reading, watching television, and listening to music. I have a library of over 4,000 videos, laserdiscs and dvds which I watch on my killer home theater setup. My favorite television shows are XENA: WARRIOR PRINCESS, BABYLON 5, THE X-FILES, BUFFY, THE VAMPIRE SLAYER and ROAR.